Will Ferrell and Mark Wahlberg have proven to be a successful comedy duo in two movies. Now they are set to make a third together. This time, they've decided on a sequel to Daddy's Home, the hit comedy from last Christmas that managed to survive in the wake of Star Wars: The Force Awakens. Today, Paramount Pictures and Gary Sanchez Productions have officially announced that Daddy's Home 2 is happening. 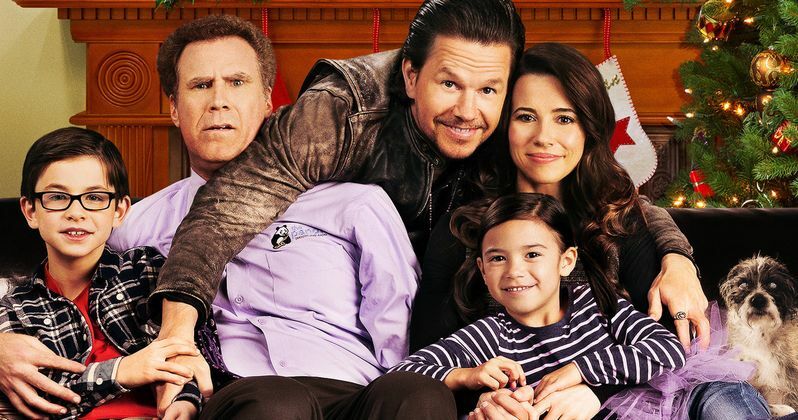 Daddy's Home proved to be a crowd pleasing comedy that perfectly matched nice guy Will Ferrell with cool, tough biker Mark Wahlberg in a battle of wits. The movie pulled in $150.3 million domestically. And it made another $90 million overseas. That brought its worldwide grosses to $240 million, making it a blockbuster hit. The movie was the biggest offshore release in Will Ferrell's long and storied history. Both Will Ferrell and Mark Wahlberg have already signed onto to reprise their roles as Brad Whitaker and Dusty Mayron, respectively. Original writers Sean Anders and John Morris will be back to write the screenplay for Daddy's Home 2. All plot details are being kept under wraps. The original movie ended with Brad and Dusty becoming good friends. When Dusty's new stepchildren see their dad ride into town, it spells trouble. The new father in question is a fun spoiler. So stop reading now if you haven't seen the first movie. The end of Daddy's Home gets a very fun cameo from WWE SuperStar John Cena. It isn't known if he'll be joining the cast for a much bigger role this time out. Cena has proven to be quite funny in such movies as Amy Schumer's Trainwreck and the Tina Fey and Amy Poehler party comedy Sisters. According to Deadline, there is also no word whether handyman scene stealer Hannibal Buress will return either. Also not yet confirmed are mom Linda Cardellini and boss Thomas Haden Church. In the original Daddy's Home, Brad (Will Ferrell) is a kindhearted radio executive who wants to be the best possible stepfather to his wife's (Linda Cardellini) two children. When her freewheeling ex-husband Dusty (Mark Wahlberg) breezes back into town, Brad's feeling of insecurity quickly develops into an inferiority complex. As Dusty demonstrates his flair for athletics, home repair and bad-boy charisma, Taggart finds himself in a no-holds-barred battle to one-up his rival and win the approval of his family.